Imagine an exhibit where you’re not only encouraged to touch the artifacts on display, but to actually smell and taste them too. Such is the case at the Poetic Food exhibition, part of the In The Mouth event for the next two weeks at the Phi Centre. The exhibition plays with the relationships between food, nature, and the human body. 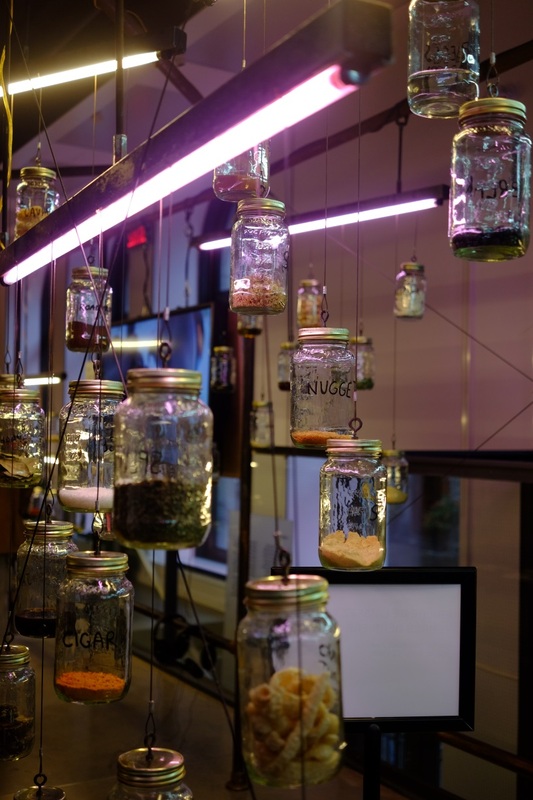 Guided by a trail of plant votives suspended from the industrial ceiling, visitors follow biology PhD Brigitte Hough on her journey to discover the rare cases of people who literally became what they ate. Hough has made her living studying curious incidents throughout history when humans had food and plants growing inside of them, after having ingested the item in question. Each of the case studies is beautifully illustrated with a watercolour drawing of the organ where the plant is taking root. A counter towards the centre of the exhibition beckons visitors over with a plate full of what look like gummy candies. Being the glutton for free food that I am, I didn’t think twice before picking one up and popping it in my mouth. Instead of a gummy, I was surprised to bite into a gelatinous, plasticky feeling dome, which exploded with a piney flavour as I chewed. The plaque next to the dish explained that I had just eaten a living thing, being in this case a plant seed, and that I should begin to feel a new life taking form within me. Essentially, if I am to take this literally, I may have become pregnant with a tree. Or, as I’m hoping the case may be, I was just supposed to feel naturally invigorated after eating this live matter. Next to the counter was a small wooden chamber, where visitors were invited to step inside and be pollinated, accompanied by the sounds and smells of nature. Upon entering the small wooden box, I was enveloped in darkness as floral scents were piped through the air and sounds of crickets and whistling winds played around me. It was a strangely relaxing experience, sort of like an aromatherapy session, but not to be recommended to the claustrophobic. Further into the exhibition, visitors were encouraged to open up and smell (or taste if they dared) from mason jars that hung from the rafters. Each one was labelled with an identifiable smell, but filled with unidentifiable substances. The smells ranged from places to people to food to nature, for example, “Montreal,” “roses,” “grass,” “tuna,” and “rockstar.” None of the scents were especially pleasant, and all were extremely pungent, but it was an interesting exercise on how certain smell-associations can be broken apart and put back together using different materials such as the spices, herbs, and food particles that were found in the jars. The main event, however, centres on the case of Chef Nuno, who is affected by the rare condition of dysgeusia. Essentially, this means that he has a mixed-up sense of taste, and cannot identify flavours the way the average individual can. From the description, this condition is the taste-equivalent of being colour blind — instead of a sardine, his brain tastes an artichoke. Patrons are invited to dine for a night in Chef Nuno’s world, during nine Food Nights over the course of the exhibition’s stay at the Phi Centre. During these Food Nights, each guest will be offered an experimental and tailor-made three-course meal. The meals will be prepared in order to evoke psychological responses from each dinner, based on a questionnaire that must be filled out prior to the event. Because of Chef Nuno’s garbled sense of taste, no dietary restrictions can be implemented for the dinners, so picky eaters or people with allergies beware. The Poetic Food Centre exhibit runs from Oct. 15 to 31 at the Phi Centre, and is free to enter. Reservations for the Food Nights inspired by Chef Nuno must be made in advance for specific dates, and cost $75. The Phi Centre is located at 407 Saint-Pierre St., in Old Montreal. For more information, visit inthemouth.ca.